Emphysema is a chronic obstructive pulmonary disease. Chronic obstructive pulmonary disease (COPD) refers to a group of progressive respiratory diseases, including both chronic bronchitis and emphysema. More than 120,000 Americans die from COPD each year,making it the 3rd leading cause of death in the U.S. In the early phase of COPD, patients may experience wheezing, chronic productive cough, and minimal shortness of breath. However, the person's quality of life decreases as COPD progresses. Later symptoms include increasing dyspnea, progressive exercise intolerance, periodic respiratory infections that occur with increasing frequency and severity, increasing cough, and purulent sputum. Emphysema: Caused by progressive destruction of pulmonary connective tissue, usually by an inflammatory process and/or cigarette smoking. Air sacs distal to terminal bronchioles become permanently enlarged, and interalveolar walls are destroyed. The result is airway obstruction, particularly upon expiration. Lungs become hyperinflated, and lung volume increased. 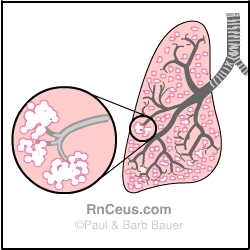 The diagram above shows tissue destruction throughout the lung, and overdistended alveoli with destruction of septa. increased anterior-posterior diameter, or "barrel chest"
Emphysema is a chronic obstructive pulmonary disease (COPD). Visit the "therubins" website http://www.therubins.com/illness/respcopd.htm for indepth information about COPD. Look for the answer to this question: How many people in the US are affected by COPD? The person with emphysema may assume a sitting position, leaning forward with arms braced against their knees, chair or bed ("tripod" position).